Las Vegas Rent A Car Tips | ScottyVegas! For me the only way to get around Las Vegas is by renting a car. It’s a perfect place to store your luggage when arriving early in the day or departing late at night. Checking out off strip properties (Better table odds with low minimums) or visiting local attractions is something I enjoy doing early each day. As a bonus, food is much cheaper off the strip too. McCarran Airport uses a free shuttle service located on the ground level that takes you to a rent a car center. Signs are posted everywhere making navigation to it easy. Shuttle buses are plentiful and lines move quickly. Once boarded it is only about an eight minute drive to the center. Tip: I found Dollar rent a car to have the best deals in Vegas. If you have an American Express card they have a standing 10% discount with promo code: AX10. Book early for the best deals and check frequently. If you find a better deal, book it and cancel the old one. I have been very lucky doing this. Also Dollar offers Dollar Express, once you sign up (FREE) it allows you to bypass the often loooong lines at the counter and go directly to the Express booth where your paper work is already waiting. After signing a few times you are off to your car. They will point you in the direction of the car class you reserved and tell you to pick out the one you want. Tip: Not all cars have power locks and windows (Yes, they still make these). It’s my recommendation that you pick one up with at least power locks. It’s amazing how dependent we’ve become to them. If you don’t it will soon become evident the first time you run back to double check the doors. I made this mistake once and will never again forget to check for power locks. Regardless of the car rental company you choose, look over the car carefully. I have never had a problem through Dollar but there is always a first time. Remember note on the paper any dents or scratches, and don’t forget the interior. Tip: I often make note of a few extra in common areas just in case. Now that you have picked out your car and checked it over, you are ready to go. Your final stop is the exit booth where they will check over your paperwork and lower the bar so you can exit. Once you exit the center you only need to make two right hand turns to get on Las Vegas Boulevard! 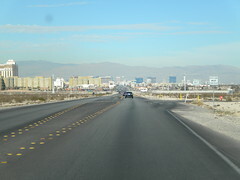 When on LVB just head straight (North) to “The Strip”. Tip: The Famous Las Vegas Sign will be on your left hand side (in median) just outside The Strip. There is parking available so you can take pictures but you can only enter the parking lot from the South bound side. So if interested, loop around and take pictures, as you will see everyone else is at all hours of the day and night. Returning cars to the center is just as easy as there are plenty of signs to direct you to the rent a car center. I know at dollar you simply drive up where you will be met by a check-in person who scans your paperwork, then car and finally hands you a receipt. Yes it’s that easy! Next, just make your way to the shuttle bus that will take you to your airport terminal. Tip: Before leaving remember to verify amount charged with amount quoted. On my last trip they forgot to apply a discount. Hey $15 bucks is $15 bucks! I simply went to the return counter where the adjustment was quickly applied pain free. Dang! This was supposed to be a short and quick post… Sorry I wanted to make sure I covered everything. One last Tip: If you have a GPS bring it and don’t forget to update it before you leave. The rental companies charge $9.00 or more per day to rent one. Trust me a GPS is gold when driving around Vegas.